Discover Australia's best-kept pet food secret, the Wild Kangaroo, with Addiction's Outback Kangaroo Feast. Not only will your dog find it hard to resist the exquisite taste of Wild Kangaroo, this health-giving protein is prized as a lean, high quality game meat. Wild Kangaroo is a ‘muscle meat' that provides essential amino acids to support weight maintenance, muscle building, tissue repair and metabolic process. 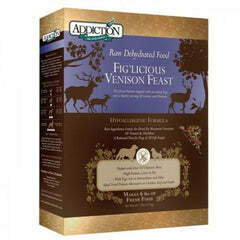 Addiction's Outback Kangaroo Feast is a wellness recipe designed for peak performance for all life stages.